The Ingrian War between Sweden and Russia, which lasted between 1610 and 1617 and can be seen as part of Russia's Time of Troubles, is mainly remembered for the attempt to put a Swedish duke on the Russian throne. It ended with a large Swedish territorial gain in the Treaty of Stolbovo which laid an important foundation to Sweden's Age of Greatness. During Russia's Time of Troubles, Vasily IV of Russia, besieged in Moscow by the Tushino gang and driven to despair by the ongoing Polish intervention, then entered an alliance with Charles IX of Sweden who was also waging war against Poland. The tsar promised to cede Korela Fortress to Sweden in recompense for military support against False Dmitry II and the Poles. Thereupon the Swedish commander Jacob de la Gardie joined his forces with the Russian commander Mikhail Skopin-Shuisky and marched from Novgorod towards Moscow in order to relieve the tsar. Sweden's involvement into the Russian affairs gave King Sigismund III Vasa of Poland a pretext to declare war on Russia. The Poles engaged the combined Russo-Swedish forces at Klushino and destroyed most of the Russian force; the Swedish mercenaries taking part in the De la Gardie Campaign (July 1610) surrendered. The battle had serious consequences for Russia, as the tsar was deposed by boyars and the Poles occupied the Kremlin. In 1611 a Swedish expeditionary corps under Jacob De la Gardie captured Novgorod. The Novgorodians asked the Swedish king to install one of his sons — Carl Filip or Gustavus Adolphus — as their monarch. In the meantime, Gustavus Adolphus succeeded to the Swedish throne. The young king decided to press his brother's claim to the Russian throne even after the Poles had been expelled from Moscow by a patriotic uprising of 1612 and Mikhail Romanov had been elected a new tsar. While the Swedish statesmen envisaged the creation of a Trans-Baltic dominion extending northwards to Archangelsk and eastwards to Vologda, De la Gardie and other Swedish soldiers, still holding Novgorod and Ingria, saw the war as a reaction for their forces not receiving payment for their succour during the De la Gardie Campaign. In 1613 they advanced towards Tikhvin and laid a siege to the city, but were repelled. The Russian counter-offensive failed to regain Novgorod, however. The Russian tsar refused to commit his troops to battle and the war lumbered on until 1614, when the Swedes captured Gdov. 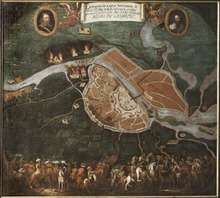 The following year they laid siege to Pskov but Russian generals Morozov and Buturlin held their own until 27 February 1617, when the Treaty of Stolbovo stripped Russia of its access to the Baltic Sea and awarded to Sweden the province of Ingria with the townships of Ivangorod, Jama, Koporye and Noteborg. Novgorod and Gdov were to be restituted to Russia. As a result of the war, Russia was denied access to the Baltic sea for about a century, despite its persistent efforts to reverse the situation. This led to the increased importance of Arkhangelsk for its trading connections with Western Europe. This article incorporates material from the public domain 1906 Brockhaus and Efron Encyclopedic Dictionary.